BRIDGETOWN, Feb 17 2012 (IPS) - Like most of its neighbours in the English-speaking Caribbean, Barbados’s main economic asset is its coastal zone. So it is no surprise that coastal instability due to climate change and an increasing frequency of disasters has caught the attention of officials on the tiny island where sandy beaches, coral reefs and other coastal ecosystems distributed along 97 kms of shoreline and a warm tropical climate create optimal conditions for a tourism industry. The coastal zone is also central to the social and recreational lives of Barbadians, attracting more than one million people to beaches every year. But environmental and government officials say climate change is affecting and has the potential to severely modify the country’s climate risk profile by altering the frequency and severity of existing coastal hazards, as well as generating new hazards such as sea level rise, in turn increasing socioeconomic vulnerability. In response to this threat, Barbados is undertaking a Coastal Risk Assessment and Management Programme (CRMP), aimed at building resilience to coastal hazards and climate change across all impacted sectors, including agriculture, health and energy. “By its design, its intention is to integrate climate change adaptation and disaster risk reduction considerations into the existing Integrated Coastal Zone Management Programme of Barbados,” Leo Brewster, director of the Coastal Zone Management Unit (CZMU), told IPS. “The level of detail in the programme is intended to ensure that Barbados has the most up to date knowledge on its marine and coastal zone and the areas of greatest vulnerability to coastal and other hazards. “It will result in the development of a comprehensive decision support tool for coastal management for the island,” he added. The situation in Barbados is not only of interest to that island, but also its closest neighbour, Grenada. The island’s Minister of Foreign Affairs Karl Hood has expressed grave concern for Barbados, which he described as “the flattest of our islands”, and the dislocation that a rise in sea level could cause for the residents of that country. “Now you talk about a sea level rise and Barbados is in a lot of trouble because there aren’t any big mountains there. You cannot pick up the whole population of Barbados and say let’s put them in the Guyana interior (for example) because there is a lot of room there, you can’t do that,” Hood told IPS. “This is what we have, everybody feels very much tied to their heritage, to their homeland and the loss of a homeland is difficult. “You never feel at home in anybody else’s home. Even though we are small, this is our pride, this is all we have, this is who we are and losing that is what we don’t want and so we have committed ourselves to fight,” said Hood, a former environment minister. Barbadian officials say as a result of the new programme, there will also be new roles and responsibilities in respect of hazard mitigation that will go beyond the ambit of the CZMU and include the Town and Country Planning Office and the Department of Emergency Management. “This new programme is being viewed with great interest globally as Barbados will be one of the first countries to incorporate coastal risks into a mature and successful integrated coastal zone management programme,” Prime Minister Freundel Stuart said at the launch of the project at the end of last month. “The Coastal Zone Management Unit’s technical team must be commended for the conceptualisation and development of its components. As a result, Barbados as a small island developing state is now a champion of coastal best practices at the regional and international levels and coastal states across the globe are seeking technical assistance and advice from our coastal experts,” he said. Stuart said that through this project, the CZMU is working on incorporating coastal climate change adaptation technologies and methods, as well as disaster risk reduction considerations, into integrated coastal zone management processes. Stuart said that the project – the first of its kind to be undertaken in Latin America and the Caribbean – will deliver a comprehensive evaluation of the risks and vulnerabilities of Barbados to sea level related hazards such as storm surges and tsunamis. Brewster said the island is setting the pace for the rest of the region. “As a first within the region, it is hoped that it will demonstrate the significance of integrated coastal management and planning for small islands and encourage the use of similar strategies, while avoiding the pitfalls of the past related to coastal tourism development. “It is hoped that it will prove to be a positive case study that will have potential long term application for the region and allow for the expertise developed in Barbados to be exported to assist other countries which may have similar issues,” he added. The multi-million dollar programme is co-financed by the Barbados government through a 30-million-dollar loan with the Inter-American Development Bank (IDB). Brewster said that the loan agreement was signed a year ago in February 2011 and the programme has reached the stage of Expression of Interest for its three main components, in which firms are short- listed for approval by the IDB and submission of technical proposals begins. 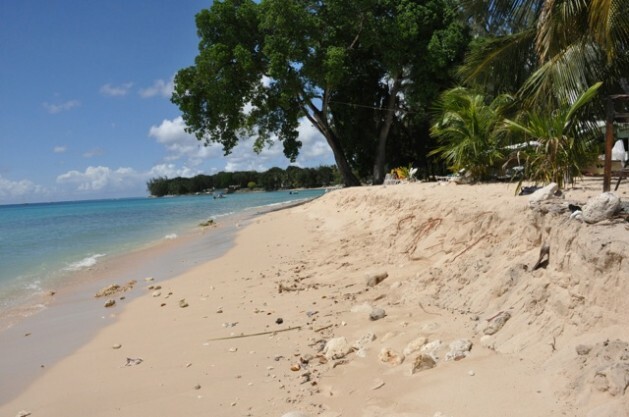 The implications of climate change for Barbados include sea level rise, beach erosion, drought due to changes in climate patterns and increased flooding events from uncharacteristic rainfall events, potable water shortages, impacts on agriculture, coral bleaching, and coral reef death. “Having a greater understanding of the climate change issues that can affect the island, the CRMP will assist in the identification of high risk hazards areas and provide opportunities for more effective development planning within the coastal zone,” he said. “It will also provide for the development of standards to adapt to climate change events that will lead to greater protection being offered to coastal developments and improved shoreline management plans being implemented,” he added.